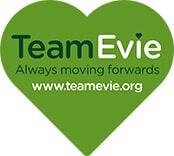 Home › News › Katy Daley-Mclean | A day with Team Evie! Katy Daley-Mclean | A day with Team Evie! We were so proud to spend a day with our patron Katy Daley-Mclean at the Great North Children’s Hospital and Nectar Headquarters, showing off the work that we do supporting sick children and their families in our region. Thank you so much to Katy for her time and support, and thank you so much to those staff members on all the wards who took the time to speak to us (some on their days off!) and pose for photographs!